The picturesque Ring of Kerry is a looping road on the west coast of Ireland. It meanders along the coast of County Kerry, a pristine area famous for its awe-inspiring natural beauty. Locals and travelers alike flock to the Ring of Kerry for sweeping views of mountains, lakes, waterfalls, and the North Atlantic. Along the way, you’ll see castles, abbey ruins, and stones circles dating as far back as 2,200 BC! That’s a whole lot of human history. I can confidently say that the Ring of Kerry was the most breathtaking road I’ve ever driven on in my life. To help you have the same memorable experience, I’ve compiled all the stops of interest along the Ring, along with maps to help you navigate. Read on for your complete guide to Ireland’s unforgettable Ring of Kerry! As you can see on this Ring of Kerry map, you could drive the entire loop straight through in only three and a half hours. The Ring of Kerry is a 111 mile (179 km) coastal road around Ireland’s Iveragh Peninsula. Technically, the Ring of Kerry is the horseshoe-shaped N70, but you can take a linking road, the N72, to make a full loop beginning and ending in the town of Killarney. This closed loop covers 133 miles (214 km) in total. Because of its location on the landlocked end of the peninsula, Killarney is a popular base for travelers driving the Ring of Kerry. If you were to drive directly around the Ring, you could complete the drive in just three and a half hours. Realistically, though, you should set aside at least six to seven hours to make stops along the way, if not longer. If you want to take side trips or explore all the sights along the route, then you could turn the Ring into a two or three-day road trip, staying overnight in one of the villages, like Waterville or Kenmare. In addition to pulling over to see castles, Celtic ruins, lookout points, and friendly cows and sheep, you could also go hiking, biking, or horseback riding. A popular day trip also takes you out to the Skellig Islands. The larger of the islands, Skellig Michaels, is famous for its 6th century ruins, which were featured in Star Wars: The Force Awakens. Before getting into all the sights along the Ring of Kerry, let’s go over how to travel along the road. Should you hop on a tour bus or rent a car and drive yourself? There are two options for driving the Ring of Kerry: tour bus or car. Several bus companies are available for day trips, or you can easily navigate the route yourself (it is a loop, after all). Here’s what you need to know about both options. Most Ring of Kerry tour buses start in Killarney. If you’re starting your Ireland trip in Dublin, you can also buy packages that include a train ticket from Dublin to Killarney and next-day tour bus. The two most highly-rated companies are Deros Coach Tours and O’Connell Day Tours. A day tour costs about $25. The buses will make a few stops along the way for you to explore sights and take photographs, plus a lunch stop. All in all, a Ring of Kerry tour on a bus lasts about 6.5 hours. One important thing to note – the buses always drive counter-clockwise along the Ring. They start in Killarney and then head northwest to Killorglin. Now let’s look at the other option (and the one that I chose), driving the Ring of Kerry. Tour buses drive counter-clockwise on the Ring of Kerry. Your other option is to drive. I much preferred driving, as it let my friend and I go at our own pace and pull over whenever we spotted an amazing view, which was extremely often. We had no trouble renting a car in Ireland. We rented the car online from Dooley Car Rentals and picked it up at the Dublin airport. There are also rental car companies based out of Killarney. The only unusual part of the rental agreement is that US travelers have to buy additional car insurance. If you’re renting a car in most other countries, your usual car insurance will extend to the rental. While driving lets you take your time and make stops on a whim, it does come with a significant extra challenge for US drivers: you have to adjust to driving on the left side of the road! At first, this arrangement made my brain feel like it was doing backflips, plus I kept driving too far to the left. Admittedly, my friend was the better left-side driver of the two of us, but I gradually got used to it, too. As long as you stay focused, you shouldn’t have too much trouble making the switch. As I mentioned above, buses go counter-clockwise along the Ring of Kerry. If you’re driving, should you go in the same direction as the buses or the opposite way? Which Direction Should You Drive on the Ring of Kerry? Should you drive with the buses or against them? That all depends on how confident you feel driving. If you drive in the opposite direction of the Ring of Kerry tour buses, then you may have to deal with passing them. As the road can get narrow and have steep drop-offs along the side, this might be an unwelcome extra challenge. If you don’t want to deal with passing tour buses on a narrow road, then you should go counter-clockwise. On the other hand, driving with the buses means that you might get stuck behind one of them. Staring at the back of a bus for most of your drive could mar the view a bit. If you’d rather not get stuck behind a tour bus, then you should probably choose the clockwise route! For the purposes of this guide, I’ll present the stops in the counter-clockwise direction, the same way that the buses go. If you decide to go the other way, then just scroll down and read this guide backward. Now that we’ve covered transportation, let’s go over all of the intriguing places and things you’ll pass on the drive, starting with a Ring of Kerry map. Here’s the full Ring of Kerry map with pins for each stop. Click on each one for its full address, and scroll down to learn more about each stop! Since there are lots of points of interest, I’ll provide some suggestions for the best ones at the end of this guide. You can also plan your trip around your personal interests, whether you want to spend all your time photographing castles, hiking up mountains, or shopping in all the villages along the way. Whatever you choose, you really can’t go wrong. The drive itself is one of the best highlights of all! Since most of the Ring is remote, I’d suggest using a GPS, pre-loading your directions into Google Maps, and/or downloading a navigational app that works offline, like Here WeGo. You’ll have to download Ring of Kerry maps before you depart, but then you should be able to plug in directions offline. Any place you stay will probably also give you directions the old-fashioned way – with a paper map of the Ring of Kerry and circles around the places of interest. If all else fails, just keep driving. The Ring of Kerry is a ring, after all. Most people start and end their Ring of Kerry journey in the town of Killarney, so let’s start there. There are lots of Kerry hotels in Killarney, plus other hotels in Kerry villages along the way. Below is the full list of stops along the Ring of Kerry. Click on a stop to go to it directly, or just read on to learn all about the spectacular stops you’ll encounter driving counter-clockwise on the Ring. Now let’s take a closer look at all the stops along the Ring of Kerry, starting with the most popular starting point, the town of Killarney. Killarney is a colorful small town that looks like it was plucked out of the 19th century. As a popular destination, it actively maintains its historic charm. In fact, the Killarney town council banned plastic store signs in the 1980s so that the town would retain its pretty, old-fashioned look. While there are several great Ring of Kerry sights within a ten to thirty minute drive of Killarney – like Ross Castle, Muckross House, and Muckross Abbey – the town itself shouldn’t be overlooked. Killarney might not blow your mind like the Ring of Kerry landscape, but it has lots of enjoyable restaurants, pubs, shops, and galleries. You’ll find a variety of restaurants, from traditional Irish pubs to Thai and Mexican food. Some of the top restaurants in town are Rozzer’s, Bricin, Mareena’s Simply Food, Quinlans Seafood, Hannigan’s, and the Yew Tree. Before I visited Ireland, I’d heard mostly negative reviews of its cuisine. I found the exact opposite to be true, with lots of modern restaurants and delicious food from all over the world. While I heard negative things about Ireland’s cuisine, I heard stellar reviews of its beer. That reputation was totally accurate; both the beer and cider are high-quality and easy to find. Some great pubs in Killarney are O’Connor’s Traditional Irish Pub, Jarvey’s Rest, The Danny Mann, Tatler Jack, and Dan Linehan’s Bar. Take a seat, order a Guinness, and, ideally, stumble upon an Irish “session” of local musicians playing the fiddle and accordion. Ireland is famous for its high-quality wool sweaters and blankets. Killarney’s shops are centralized in its downtown area. You’ll find the famously high quality wool sweaters from Ireland’s Aran Islands, jewelry, glass crafts, candles, souvenirs, art galleries, and old-fashioned candy shops. You can also shop at some name brand stores at the Killarney Outlet Centre. Killarney has a couple 19th-century churches that are worth a visit if you like historic architecture. St. Mary’s Cathedral is a 19th-century Gothic Revival Church, and the 1879 Franciscan Friary is a simple stone structure. Killarney is a charming town that’s fun to explore or at least enjoy dinner the night before you depart on the Ring of Kerry. If you’re pressed for time, though, you might skip the town and concentrate on the drive instead, as the Ring of Kerry is the most memorable part of the trip! You don’t have to wait long before the Ring of Kerry plunges you into Ireland’s unparalleled natural beauty. Just ten minutes or so from Killarney you’ll enter the part of N70 called Gap Road, or the Gap of Dunloe. The Gap of Dunloe is a 7 mile (11 km) mountain pass between Purple Mountain and a range called MacGillycuddy’s Reeks. It passes five lakes: Coosaun Lough, Black Lake, Cushnavally Lake, Auger Lake, and Black Lough. Between Coosaun and Black Lake is a wishing bridge. You can stop here, make a wish on the bridge, and, according to local legend, your wish is destined to come true. Since the Gap of Dunloe is such a scenic route, it’s a popular spot for biking, hiking, horse-drawn carriages, and horseback riding. If you’re driving, go slow and expect that other people and vehicles will be sharing the road. Kate Kearney’s Cottage is a 150-year-old restaurant and pub along the Gap of Dunloe. You’ll pass fields filled with flowers and horses before pulling into the parking lot of this charming, ivy-covered cottage. In the front of Kate Kearney’s sits a shop that sells local crafts and produce. In cooler months, you can sit by the open fire and enjoy pub food and dark beers. Every so often, the cottage holds a traditional Irish dinner with live music and costumed dancers. I stopped at Kate Kearney’s for lunch and especially enjoyed the fried brie with jam and homemade banoffee pie (toffee pudding pie with banana slices and fresh whipped cream). If you’re hungry, then stop here to get fortified for the trip ahead. If not, don’t worry – there are plenty of villages with pubs and restaurants along the way. Beaufort is a small village at the base of Carrantuohill, Ireland’s tallest mountain. By small village, I mean small; Beaufort has a population of only 160. The town center has a few pubs and guesthouses, so you could stay here as an alternative to Killarney. If you’re looking to stay somewhere remote, then Beaufort’s a good option. Otherwise, you probably would put this town lower on your list of Ring of Kerry priorities. One intriguing site near Beaufort involves an early written language. Outside of the town sit the Ogham Stones. These stones feature Ogham, the earliest system of writing to appear in Ireland. In Ogham, letters are represented by short horizontal lines etched across a long vertical line. You might see souvenirs of common names written in Ogham or jewelry featuring the ancient writing. These 17th century mills have been creating fabrics and yarn from wool for over 300 years! When they began, they used water from the adjacent River Gweestin to power machinery and wash and dye wool. Today, you can check out the mills and shop for high-quality wool sweaters, capes, scarves, blankets, and rugs. These mills are worth a stop if you’d like to buy wool clothing or a blanket. If you’re not looking to shop or don’t care for wool products, then you might skip these mills and save your shopping for other places further down the Ring! Sheep are a-plenty in Ireland, and so are wool sweaters! Killorglin’s another village along the Ring of Kerry. It’s a bit bigger than Beaufort with a population of 2,100. This town along the River Laune has a number of hostels, inns, pubs, restaurants, outdoor activities, and yearly festivals. Killorglin is definitely worth a stop if you want to go on an outdoor excursion. Because it’s on a river and close to the Atlantic, it has a lot of opportunities to kayak, canoe, and sail. You can also go climbing, hiking, orienteering, or camp overnight. Killorglin is also a good stop if you’re feeling hungry. The town has a variety of pubs and restaurants, and it makes its own beer, the Crafty Divils King Puck. You’ll see a bunch of references to King Puck beyond this pale ale, like the King Puck statue, a large, crown-wearing bronze goat perched atop a rock. According to legend, a goat helped save the people of Killorglin long ago when raiders were pillaging the countryside. The “puck” broke away from its herd and appeared in the village, alerting the people to the danger. This story is such a big part of Killorglin that the town has been hosting a 3-day Puck Fair every August for the past 400 years! If you’re driving the Ring in August, check to see if the Puck Fair is going on. You might also be interested in the K-Fest Musics and the Arts cultural festival in June or the Flavour of Killorglin food festival in September. Once you’ve had your fill of food and festivals in Killorglin, keep on driving southwest toward the Kerry Bog Museum. Order King Puck, a pale beer made in Killorglin! With its glacier-carved mountains and cliffs and ancient stone ruins, the Ring of Kerry takes you back in time. The Kerry Bog Village Museum transports you to the 19th century, showing you the tough existence that people carved out for themselves in a peat bog. The Kerry Bog Village Museum features six dwellings with thatched roofs that have been restored to their original 1800s conditions. You can see how the blacksmith, thatcher, and laborers lived, as well as meet the native Kerry bog ponies and huge Irish wolfhounds native to the area. Irish wolfhounds may be all different colors, but all of them share one trait in common: they’re huge. This area is called the Jewel in the Ring of Kerry. Here, you’ll see all the natural beauty that makes the Ring of Kerry great in one place: hills, mountains, rivers, beaches, and the wild Atlantic. It’s a popular place for hiking, nature tours, and horseback riding. I went horseback riding in Glenbeigh with Burke’s Beach Riding. We looped around Curra Mountain, descended into Horseshoe Valley, and rode along the sandy Rossbeigh Beach. The views over the sheep-filled fields and outstretched Dingle peninsula were spectacular, and horseback riding along the trails and beach was an unforgettable way to take everything in. Trail rides are available for both beginners and more experienced riders. I highly recommend doing one. Cahirciveen is a colorful small town with a population of around 1,300. Its main attractions are the Cahergal and Leacanabuaile forts, the remains of stone forts built around 600 AD that suggest the existence of an early Christian farming community. You could also visit the Daniel O’Connell Memorial Church, one of the only churches in Ireland named after a layperson, and old army barracks that have been turned into a heritage center. Cahirciveen is proud of its history as the spot where the first shots of the 1867 Fenian Rising were fired, a rebellion against British rule. Cahirciveen is worth a stop for the old stone forts, but if you’re pressed for time or staying on the eastern part of the ring, then you could opt to see Staigue Fort instead. After Caherciveen, the next place you could stop is Ballycarbery Castle. This once proud 16th century castle on a hill now stands in ivy and moss-covered ruins. As a huge fan of evocative ivy-covered ruins, I’d put this castle high on the list of must-sees. It’s a quick stop, but it’s a quintessential Ring of Kerry sight. Check it out! Note about the next few stops on the list: The next four stops are actually located on Skelligs Ring, an offshoot of N70, which is the technical Ring of Kerry. You can visit the villages of Portmagee and Valentia Island, take a boat to the Skellig’s Islands, or drive along St. Finian’s Bay. If you don’t have time or interest to venture off the Ring, then feel free to skip down to #15 on this list, Waterville! This village, located 10 minutes off of N70, has some restaurants and accommodations, so you can stop here for lunch or to stay overnight. It’s most notable as the gateway to the Skelligs Islands, though, as well as the town you pass through to take the bridge to Valentia Islands. These islands lie just off the coast of Portmagee. Both are protected as bird sanctuaries, and they contain bustling populations of puffins, gannets, Arctic terns, guillemots, herring gulls, razorbill, fulmars, manx shearwaters, and cormorants. You can take a boat around Little Skellig, and you can actually land on and explore Skellig Michael. When you get to Skellig Michael, you’ll see the other-worldly remains of a 6th century Christian monastery. Monks lived a remote existence in beehive-shaped stone formations. Everyday, they descended 670 steps to catch fish for their meals. The ruins are now protected as a UNESCO World Heritage site, and they’ll look mighty familiar if you’ve seen Star Wars: The Force Awakens. At the risk of spoiling the ending for anyone, I’ll just give you a two-word reminder of the scene: Luke Skywalker. To tour the Skellig Islands, you can sign up for a boat tour from Portmagee, Valentia Island, or Waterville. As protected areas, the number of visitors each day is limited, so sign up early! You can reach Valentia Island, one of the most western points of Ireland, by bridge from Portmagee. Valentia played an important role in history – it was one of the stops of the first ever successful transatlantic cable. You should come to Valentia if you want to go hiking or see the majestic sea cliffs. You can hike the Geukaun Mountain and walk along the 600-foot cliffs. You can also walk out to tetrapod tracks, prints preserved from an animal for the past 385 million years. If I didn’t emphasize it enough already, the Ring of Kerry will blow your mind with the extent of its far-reaching natural and human history. 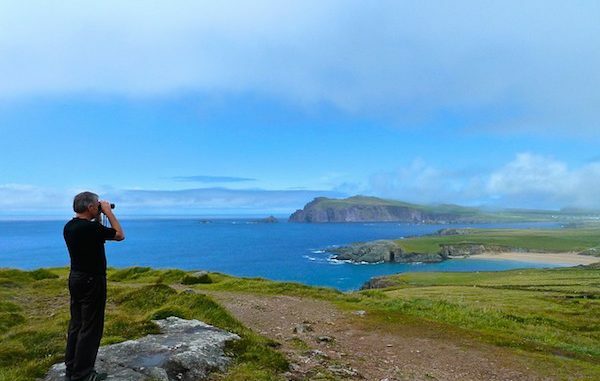 St. Finian’s Bay, known locally as the Glen, kicks up the natural beauty into hyperdrive with rolling mountains on one side and views across the Altantic, Skellig Islands, and Puffin Island on the other. Because of its big waves, St. Finian’s Bay is especially popular with divers and surfers. Another draw is Skellig’s Chocolate, a small, family-run chocolate factory and cafe with beautiful views over the bay. Balinskelligs is a coastal village of about 350, and one of the few remaining places in Ireland where people still speak Irish! You can find some pubs, cafes, and restaurants here, as well as accommodations to stay overnight. The best stops are Balinskelligs Beach, locally known as Ladies Beach, and the nearby ruins of McCarthy Mór Castle. If you do stay overnight, you can take a “dark sky tour.” Since the area’s so free of pollution and light, you can see the stars and planets in the night sky as our ancient ancestors did. Go star-gazing in Balinskelligs with one of their “dark sky” tours! This tiny village has a population of only 540, but it has plenty of restaurants, cafes, pubs, and hotels if you’re looking for a meal or to stay overnight. Like Beaufort, it’s one of the stops where the first transatlantic cable was laid in 1865. In 1866, a ship left from Waterville and laid cable from Ireland to Newfoundland, thereby linking Europe to North America. Waterville has a bunch of outdoor activities, including cycling, fishing, surfing, horseback riding, golf, beaches, and nature tours. Every August it holds a Charlie Chaplin Comedy Film Festival. Why? Waterville was a favorite vacation spot for Charlie Chaplin back in the day. Ready for some more old stone structures? The Eightercua Stones is an important stop on most Ring of Kerry maps because the standing stones date all the way back to 1700 BC! This east-west row of stones is thought to be a Megalithic tomb and possibly the burial place of Scéine, the wife of a Milesian leader. The Milesians were a group of people that conquered Ireland. The tallest stone is nine feet, and the entire tomb stretches 25 feet. It’s definitely worth a stop if you’re a person who gets excited by ancient stone formations. And, honestly, who doesn’t get excited by ancient stone formations? Fast forward from the builders of Eightercua 2,500 years and you’ve got early Christians building a farm house inside a defensive wall. This 9th century stone fort overlooks Balinskelligs Bay. Again, it’s an intriguing and relatively quick stop if you’re interested in ancient ruins. This small village on the sea has beautiful sandy beaches and historical sites. The Derrynane Beach is a long, sandy beach sheltered by mountains. Nearby, you can tour the mysterious Derrynane Abbey, a 6th century abbey surrounded by graveyard that now sits in ruins overrun with plants. You can also check out Derrynane House, which was home to Daniel O’Connell, also known as the Liberator. O’Connell campaigned for independence from Britain in the 19th century. You can take a 30-minute guided tour of the house, learn about O’Connell and his family, and tour the surrounding 320-acre national park. Make time to see at least one beach along the Ring of Kerry, on foot or on horseback! This small village is most notable for the Caherdaniel Fort, a stone fort dating back to 600 AD. You can also find restaurants and hotels here, as well as beautiful views over Derrynane Bay. This sandy beach is popular with locals and families. It has a good restaurant next to it, the Beach Side Restaurant and Bar. If you haven’t checked out a beach already, stop here at Castlecove. If you’re all beached out, then you can leave this one off your trip. Staigue Fort is one of the most popular stops on the Ring of Kerry map when it comes to stone ruins. It’s a circular stone fort built as a stronghold for a lord or king sometime between 300 and 400 AD. This fort is especially impressive to historians because of its sophisticated engineering and stone masonry for the time. It’s a quick stop, but worth it to see what a 4th century fort looks like. This charming small village on the River Sneem (population 600) is home to several artists and craftspeople, making it a good stop for shopping at galleries and craft stores. You might also enjoy Riney’s Bar and its traditional Irish pub food and atmosphere. Since it’s on the coast, you can find a few nearby beaches: White Strand Beach, Castle Cove, and O’Carroll’s Cove. This castle was built in the late 1100s and converted into the Tudor-style around 1596. There’s only one standing wall left today. The rest is in ruins. Dunkerron can be tough to find, and you’ll have to off-road it a bit to get there. I wouldn’t highly recommend it unless you’re a diehard fan of ivy-covered castle ruins. Of all the towns along the Ring of Kerry, Kenmare (population 2200) probably has the most to see and do. It has a range of hotels, B&Bs, hostels, guesthouses, and campsites, as well as a bunch of restaurants and pubs. Some of the best restaurants in Kenmare are The Mews Kenmare, Mulcahy’s Wild Garlic Restaurant, Packy’s, Number 35, PF McCarthy’s, and The Coachman’s. One fun Kenmare attraction is its annual October festival for needlepoint lace. During the Great Famine in the 1800s, sisters of the Poor Clare convent taught women and girls this skill to help them support themselves. Outside of the festival, you can buy lace, go to workshops, and watch demonstrations year-round. Two important historical sites in Kenmare are the Old Kenmare Cemetery and the Kenmare Stone Circle. The cemetery dates back to the 7th century, and it became a place of mass burials during the Great Famine. The Stone Circle was built between 2200 and 500 BC, likely for ceremonial purposes. If you’re a Harry Potter fan, then you might also remember the town’s name from the Quidditch World Cup. Kenmare was said to be home to the professional Quidditch team, the Kenmare Kestrels. You’ll drive through Moll’s Gap on your way back toward Killarney, and you can pull over for a panoramic view of the MacGillycuddy’s Reeks mountain range. Moll’s Gap is a popular stop for tour buses, and there’s an epic lookout point, as well as a souvenir shop and coffee shop. Once you’ve made it this far, you’re starting to get close to Killarney again. South of the town is the 25,000 acre Killarney National Park, the first national park in Ireland. About a quarter of it is made up by Lower Lake, Middle Lake, and Upper Lake. It’s the most extensive native forest in the country and has the only remaining herd of wild deer. The park is open year-round for hikers and bird-watchers. The next two stops, Ladies View and Torc Waterfall, are located in Killarney National Park. Ladies View is another popular stopping point for travelers on the Ring of Kerry. This viewpoint gives you sweeping views of the three lakes and mountains of Killarney National Park. Even though it can get crowded, it’s worth the stop for the National Geographic-worthy photographs. This 70-foot high waterfall is just a five-minute walk off the road through pretty woodlands. It can get crowded, as the waterfall is a popular stop on the bus routes. For more gorgeous views over the lakes of Killarney National Park, you can climb 100 steps or so on the left side of the waterfall. This well-preserved Victorian mansion gives you guided tours of its furnished period rooms. Even if you don’t take a tour inside the house, you’ll enjoy walking around the expansive grounds. Beyond the green lawns lie stone gardens, greenhouses, and working farms with sheep-shearing demonstrations. This 15th-century abbey is surprisingly well-preserved, apart from the fact that it doesn’t have a roof. It was founded by Franciscan monks in 1448. The prettiest part of the abbey is the courtyard with a large yew tree in the center and a vaulted cloister. The nature reserve is a nice spot for walking through the woods, perhaps getting some glimpses of birds, deer, and other wildlife. The Cloghereen Blue Pool Walk takes you to the Blue Pool. Because of the limestone in the bottom, the pool can look bright turquoise. Unlike some of the crumbling ruins along the Ring of Kerry, the Ross Castle is fully intact. You can tour the inside or just admire its stone exterior and the adjacent lake. Legend has it that its original owner, O’Donoghue, leaped into the lake with his horse, table, and library. He now lives in a palace at the bottom of a lake, watching over his castle and everything that goes on around it. You can rent boats and go out on the lake, as long as you’re careful not to disturb any 15th-century underwater ghosts. Across the lake sits Innisfallen Island and the ruins of Innisfallen Abbey. Monks lived here for 950 years until Queen Elizabeth I took it from them in 1594. Not cool, Elizabeth. Once you’ve made your way through Killarney National Park and the stops along the way, you’ll end up right back where you started your journey, in Killarney! Whether you spent a few hours or a few days, you’ll see the stunning mountains, lakes, rivers, fields, and sea that make the Ring of Kerry one of the most beautiful drives in the world. With 34 stops (and then some, if you include all the spots of interest within each town), how can you choose which ones to include on your trip? While everyone’s interests vary, here are my top picks for the best stops along the Ring of Kerry. There are tons of places you could stop on the Ring of Kerry, but most of us don’t have days and days to explore. Unless you’re turning the Ring into a full-fledged, multi-day road trip, you probably want to know which stops are the best ones along the Ring. Here are my picks for the top Ring of Kerry attractions. If you don’t have time to drive the full ring, you might also choose just the west or east side and check out the top spots along the way. One common day trip from Killarney takes you to Muckross House, Muckross Abbey, Torc Waterfall, and Ladies View. Then you can drive back through Killarney and get dinner at Kate Kearney’s Cottage. The Ring of Kerry is a special place, with breathtaking vistas, roaming animals, and ancient stone formations that give you glimpses into thousands of years of human civilization. Because there are picturesque villages filled with pubs and inns along the way, you can take as much time driving the Ring as you like. The best way to decide where you want to go and how long long you want to spend is to familiarize yourself with the stops along the way and decide which ones interest you most. If you’re excited to horseback ride and take a boat to the Skellig Islands, then you might plan a three-day Ring of Kerry trip. If you’d like to make just five to six stops, perhaps a castle, some stone ruins, a lookout point, Torc waterfall, and Muckross House or Abbey, then you could fit everything into one full day. Based on how beautiful the Ring of Kerry is, I’d advise overestimating the amount of time you’ll need to take your trip. That way, you can make unexpected stops and take your time on one of the planet’s prettiest drives. When you’re driving the Ring, you might find that the fickle weather changes quickly and often from sun to rain and back again. While this unpredictable weather could mean you’ll get wet along your hikes or horseback rides, it has a silver lining – it creates prime conditions for rainbows. I saw some of the longest and brightest rainbows I’ve ever seen on my trip to Ireland. Standing beside the ivy-strewn ruins of a thousand-year-old castle beneath a rainbow, you’ll truly be in awe of the magic that dances across the rivers and mountains of County Kerry.